I've been thinking about composing a "Devil's Dictionary" for Catholics. Using such anxiety-inducing words as "liturgy," "participation," "music ministry," and the like. Another one that should send shudders of horror up your back is "ecumenism." "Ecumenism, ek-you'-men-izm. Noun. A process by which Catholic functionaries hold lengthy discussions with "dialogue partners" who are non-Catholic Christians or members of other religions, and reach agreements by which the Catholic side agrees to concede important doctrines in return for promises by the dialogue partners to (1) accept the concession, and (2) be good winners." In return, the Orthodox agree not to call us names. Well, that's fair. I'd love to buy a new house from the Catholic "dialogue partners." My mortgage would be so much more manageable. None of this is a shriek at the Orthodox. Obviously, there's not a thing wrong with the Creed of 381. Nor, generally (but see lex orandi, lex credendi) do I object to the liturgical application. After all, I'm a confirmed Byzantophile, and the Eastern Catholics do not use the filioque in the Divine Liturgy. Still, there was a reason it appeared in the Western liturgy--not that such was particularly important in light of the greater goal of facilitated surrender, apparently. Moreover, the Orthodox complaints about how the filioque was added have a great deal of force behind them. But removing it from creeds used to teach Catholicism? Which leaves what, precisely? Printing it on holy cards? Private devotions, once a month if nobody's listening? Otherwise, scrub it from existence. An interesting argument in favor of removal is that it doesn't prevent the filioque from being taught as part of the faith, in the same way that the immaculate conception of Mary is taught even though that's not in the Creed. Unfortunately, it doesn't quite work. First, it underestimates the progressive hold on catechesis, which will use this to not only drop any teaching of the filioque ("Yay--one less thing to teach. Well, if you were teaching it in the first place...."), but also use it as some kind of proof text for reversal of dogmatic determinations. "See--the church admits it's wrong. Next stop--priestesses! And condoms for everyone--especially the priestesses!" Second, it would require flying in the face of two ecumenical councils--Florence and Lyons II. This talk about "demoting" II Lyons is...interesting, I suppose. But it doesn't get past Florence, which did offer the carefully-reached compromise of "through the Son" instead. Of course, if this had half a chance of leading to reunification in the first place, it would be at least worth a look. But we aren't remotely close. It isn't the filioque that's repelling the East--it's the unrestrained goofiness rampaging through the Western Church. Starting with the liturgy, which the Orthodox commendably haven't screwed with. If I were Orthodox, I'd be a lot more worried about the reign of stupidity than the Latins holding fast to the filioque. After all, if reunification were miraculously achieved tomorrow, you'd have the Archbishop Emeritus of Milwaukee knocking on your Church doors Monday, with the Albany Iconoclast in tow, both brimming with "suggestions" for "aggiornamento" and "celebration of the community." And it wouldn't stop there, either. Nope, this is not a signpost on the path to reunification. This is simply a further "Thank you sir--may I have another?" moment in Catholic religious dialogue. As usually seems to be the case with such things. I've had a busy week at work, and have felt like crap for most of it. Plus, I'd rather spend my time off doing things like, oh, hunting for jack-o-lantern material with my daughter, carving said jack-o-lantern, mowing the lawn (well, maybe not enthusiastically) and going trick-or-treating with the kids. Thanks for your visits, and rest assured blogging will follow. This is "clear and convincing" evidence. The highest burden of proof in civil law. Okey-dokey. In the Weekly Standard, Wesley Smith offers up a survey of the evidence supporting the claim Terri Schiavo wanted her food and water yanked. ONE EVENING, during the second term of President Ronald Reagan, Terri Schiavo and her husband Michael decided to watch a television movie about Karen Ann Quinlan. Quinlan, as most readers know, had a tragic life. After overdosing on a combination of drugs and alcohol, she fell into unconsciousness and never awakened. Her parents won a lawsuit in the New Jersey Supreme Court allowing them to disconnect her ventilator. Karen didn't die immediately--she lived on for 10 more years before finally expiring from pneumonia. While discussing the movie, Michael claims that Terri stated she would not want to live hooked up to a "machine" (she's not), or be a "burden" (her parents don't consider her a burden and want to care for her). Michael's brother, Scott, backs up his claim, while his sister-in-law, Joan, told the court that Terri had approved of pulling the life support from the dying baby of a mutual friend and said that if she ever wrote a "will" she would say that she didn't want "tubes." Little did Terri know that these purported statements, uttered under very casual circumstances, would become the justification used by her husband in his six-year drive to remove her feeding tube and end her life. Indeed, based on these casual statements, Judge George Greer of the Sixth Judicial Circuit in Clearwater, Florida ruled that Michael had established "by clear and convincing evidence"--the highest evidentiary standard in civil law--that Terri would rather dehydrate to death over a period of 10-14 days than live on food and water supplied by a feeding tube. Maybe you should do something like this. Otherwise, you might want to review all your conversations on end-of-life issues since, oh, you turned 18, and start correcting any potential misunderstandings. Right now. Something about consistency and hobgoblins. In his devastating review of Debt of Honor by Tom Clancy, Christopher Buckley gave the technothriller author "credit" for managing to find the sheep-hunting metaphor in retinal surgery. Likewise, I have to give Andrew Sullivan similar credit--only he could find the pro-gay marriage argument in the Terri Schiavo battle. George Felos and Jack Kevorkian--Separated at Birth? Felos' spiritual and professional lives intersected in a public way 12 years ago, in the case of Estelle Browning. The case gained him a reputation as the person to see when you want to let someone die. Browning, of Dunedin, had written a living will in 1985, saying she did not want to be kept alive by artificial means if she ever became ill. A year later, she had a stroke. But the nursing home refused to stop feeding her because she was not technically brain dead. Her cousin and former roommate, Doris Herbert, asked Felos to take the case. He wanted to see Browning for himself. She could not speak, but Felos says his spiritual side picked up on something. He says her soul cried out to his soul and asked, "Why am I still here?" Felos does not mention Schiavo in Law as Spiritual Practice, but says he wants to start a second book when the case is over. He may talk about his spiritual journey with Schiavo then. For now, he is preparing for a hearing before the 2nd District Court of Appeal in Lakeland on June 25. He thinks the court will agree that her feeding tube should be removed. That is what is necessary, he says, "to accomplish what I believe are Terri's wishes." Does Felos believe Terri Schiavo's soul has spoken to his? Felos declines to answer, showing his lawyerly side. "It's a pending case," he says. Hmmm. Tough to say. We need a tie-breaker. Does the Attorney paint? I usually don't go for this "paranormal" crap, but this one is odd. This is a series of linked stills or whatnot taken at an allegedly "haunted" house. About 30 seconds in, you see something that's more than a little strange, and, frankly, I found it creepy. I drove over 500 work-related miles today. Puts a crimp in the blogging. My little brother Doug's heading to the front lines. As in Baghdad. His new Guard unit's getting the mobilization order shortly. He'll be on the ground by February. Nothing quite like a conversation with your flesh and blood where you discuss executing a will--and I've got three years on him. For all the turmoil (he'll be called up for 18 months), he's fine. My sister-in-law, much less so, and my mom--not. He's got three kids as well, so prayers for his family are in order. Thanks. We're not all like this, I assure you. From the Everyone Needs A Hobby Dep't., a Michigan man became the first person to ever survive a trip over Niagara (Canada) Falls without a life raft, barrel, etc. His family said he probably was feeling stuck in a rut -- laid off from the family business and bothered by his parents' retirement move to Oregon last week. "He's not a coward. But an Evel Knievel, he never was," said Raymond Jones, his father. "I don't know . . . if life became so boring, he wanted to change his life," said Raymond Jones. "I guess he has. I don't know whether he has for the better." "He did it because he wanted to be in the Guinness Book of Records. He talked about it for a month," his brother, Keith Jones, said Tuesday from the Canton home he shares with Kirk. Keith Jones said his brother wasn't mentally ill or trying to kill himself by flinging himself into the falls. "After this, I would have to say that he's insane," said Keith Jones. "He was quite calm and rational when he talked to me. He just had it in his head to do it, and I guess he did it." Interesting factoid about Falls jumping: No one has ever survived a jump over the American Falls--too narrow and too many rocks. Someone will probably try to make hay out of that one. "Canada: Even our waterfalls are kinder and gentler." Still, Canadian authorities are planning on charging Mr. Jones. That strikes me as the wrong thing to do. He survived a trip over the Falls without a life jacket! Hire him as a mascot/spokesman and have people rub his stomach for luck instead. Suggested first stop: Comerica Park. Maybe the center can hold after all. The legislature has given Gov. Jeb Bush the ability to order the reinsertion of the feeding tube in certain cases--including Terri Schindler's. More significantly, the good men and women of the Florida Senate re-worked the bill in anticipation of a challenge by Michael Schiavo's attorney and all-around ghoul George Felos, which seems to have accounted for the delay in the Senate vote. Interestingly enough, the reworked legislation garnered more votes in the House than the original version. Bravo and thanks to Gov. Bush and the men and women of the House and Senate who acted with lightning speed. Whether this will (1) be in time to prevent permanent harm to Terri and (2) be sufficient to withstand the ghoul's inevitable challenge remain to be seen. Continued storming of heaven remains warranted. Let us praise a good bishop. Stopped rubbing your eyes yet? Yes, I know: "DM: Where Bishop-flaying is not just a job, it's a way of life!" He's Bishop James A. Murray of Kalamazoo. Bishop Murray has granted Fr. Rob Johansen permission to go to Florida to offer support to the Schindlers and to help spell Msgr. Malanowski, the retired military chaplain who has been tirelessly standing with the family and friends of Terri Schindler. This is an extraordinary gesture, as it will require some shuffling to ensure Fr. Rob's congregants are covered. But Bishop Murray was willing to do it for a suffering family 1200 miles away. Bravo, Bishop Murray! God bless you, and may we have another hundred like you. Offer your support and thanks to the good Bishop here, and don't forget to support Fr. Rob and the Schindlers at the first link. I'm going to do something even more extraordinary, and not leaven it with criticism of others. Rest assured--that will be forthcoming later. Yessir, a year and a day, today. It just seems way, waay, waaaaay longer. Thanks to everyone who's come by the stump to listen to the heckler vent, and to all those who linked, praised, booed or commented. I'll try to keep muttering along. Lord knows there's plenty to mutter about. Tedious Apostate Empties His Loo Bucket. Exhibit A for the Mandatum, Marquette University Professor Daniel Maguire was given a podium today by the L.A. Times to comment on the 25th Anniversary of Pope John Paul II. In the style of a MD 20/20-chugging Marquette frat boy, Dan fires loogies off the balcony, hootin' and hollerin' all the while. His battle cry? Well, it's the same as every tedious progressive windbag who weighs in on the problems of the Church, be it Eugene Kennedy, Gary Wills or more recently, Andrew Sullivan: "Free willy!" I'm beginning to think that the "tedious" before "apostate" is redundant. Maguire is a moral and intellectual pygmy who will be lucky to be referred to in footnotes thirty years hence. To the extent religious books are found in remainder bins, his works are prominent in them, going out of print faster than an open Pepsi loses its fizz. I don't feel like soiling my blog with Maguire's words, so I'm not going to post any. Fisking Maguire is--at best--identical to trying to find durable items your dog has eaten. If you don't have to do it, don't bother. With Mags, the failure of this or any Pope to affirm anything he wants to do with Little Danny & The Twins (or their unfortunate "byproducts") constitutes a "failure" of "moral" leadership. All the grousing about "pelvic orthodoxy" can be summed up with the word "projection." It's hardly surprising that Maguire focuses--like a frat boy--on women and pelvises. After all, he dumped the frump for a newer model (Warning: Linked Article Contains Stupidity). He, and others like him, would be a lot happier as Episcopalians, not to mention much, much, much more honest. Instead, they'll plague us with birdcage liner "insights" like this for the next 20 years or so. Get used to it. They almost had me pulled in--I was hovering around the event horizon--but I managed to pull back. The joint failures of judgment by Grady Little and Pedro Martinez gave me the momentum. I can empathize, given Red Wings and Lions fandom. So, let me distract you from your pathos this morning. I'll dispense with the Lions quickly--they don't get close enough to break your heart. 1--count it--1 playoff victory since 1957. That explains my dad watching them, but not me and most others who have sold out their games ever since. In my time of fandom, after the rock-bottom of 1985-86, they got better, and fairly quickly, but ran out of gas against the far superior Oilers dynasty. Then came the collapses of 1993 and 1994, seven game first-round humiliations of regular season powerhouses by inferior teams that left the city screaming. Both of these came with legend Scotty Bowman at the helm. Out in four! Broomed. Humiliated. Clueless. Bob Errey is still trying to lace his skates to do battle with the too-appropriately named Devils. 1996--most regular season wins in the history of the league! Dragged to seven games in the second round by a far inferior Blues team with a journeyman goalie, which was won in double-OT by a bullet shot from The Captain. Euphoria! Now time to play the Avs in the Conference championship. Easy meat, even for the tired Wings, right? They'd crushed the Avs in their last regular season meeting, 7-0. Oops. They quickly added "battered" and "outskated" to "exhausted", losing in six. BUT--an odd sign of hope emerged, though it wasn't regarded as such then. A monstrous cheap shot by Claude Lemieux on Kris Draper in game 6 placed a huge chip on the Wings' shoulder. Stewing, they now had a hated rival to dispatch. Not to mention some ineffective players, which resulted in all world winger Brendan Shanahan coming to these parts. Following three straight regular season losses to the Avs, the Wings marked March 26, 1997 on the calendar. In what can only be compared to scenes from the movie Slapshot, the Wings and Avs mixed it up in a monster first period brawl that saw goalies and Europeans leaping into the fray, a WWF-style jump by Shanahan to intercept a charging Av, and big winger Darren McCarty beating the snot out of a cowardly, turtling Lemieux. Then, after a furious third period comeback, Darren the Avenger scored the OT winner, which shook the Joe to its foundations. The best, and most decisive, regular season game in the history of the NHL. I am firmly convinced that the defeat nipped the would have been Avs dynasty in the bud. The Wings, no longer intimidated by the Avs, powered through them in six in the Conference finals, and swept to the Cup over the stunned Flyers and hockey pundits, the game 4 inauguration occuring on home ice. 6/7/97. Real euphoria. A city celebrating--peacefully--into the morning. BTW, Ted Lindsay was in attendance that night. It can be done. I know, 1918--a lot longer than 1955--but remember, more than half the teams in hockey make the playoffs, making the Cup drought even more inexplicable. So close this time, and this can be turned to the Sox advantage if they tweak a team with some glaring weaknesses (um, speed?) and don't fall into blame fests. If Terri Schiavo were sitting on death row for killing three people while knocking over a liquor store, the Bishops of Florida would be fervently pleading for her life now. They certainly wouldn't be employing namby-pamby language like Bishop Lynch's in his latest statement of "concern." Sorry for the "negativity" and "detraction." I keep forgetting: all is well in our church. [Update: I hate being right. Here are Exhibits A and B: the Florida bishops in opposition to legislation changing capital punishment procedures, and in opposition to the execution of a man on death row. Should I ever be incapacitated, up to and including what some hack doctor might view as a "persistent vegetative state," it is my firm wish not to be starved to death. It may be strange to say, but I don't in fact know of any of my friends or family who have ever expressed a desire to be starved to death under any circumstances. Hope that's "clear and convincing" enough for the judicial system. I haven't seen a melee like that since Wings v. Avs in 1997. How 'bout them Red Sox v. Yankees? Rhinoplasty fastballs, coaches rushing players, and players attacking groundskeepers. Almost as much fun as goalies duking it out--but not quite. Here's my thoughts on Saturday's Affray in Fenway, or the Pounda by the Mound-a. As a local radio show host here in Motown pointed out, if the Yanks had had a real problem with Martinez' pitch, wouldn't someone besides Don Zimmer have called him out in the 4th inning? Instead, fireplug Zim takes the bull rush, and Martinez obliged him with a head-grasping ole'--and left it at that. Zimmer's fine, and he even apologized. Given the fact Zimmer's career was shortened by a beaning, I can understand his reaction to a perceived beaning of one his guys. But if it was really as bad as NYers are making out, then Garcia should have been the one going ballistic. He didn't. End of story. Fans of the Evil Empire--get a grip. Take a couple hits off the inhaler. Go to your happy place. The only important thing right now is this: The series is tied. Well, so much for the kid-glove approach. One of the most infuriating (if less obvious) things about Gov. Jennifer Granholm from the Catholic perspective is her evident, if clueless, admiration for martyr St. Thomas More. The problem, of course, is that while St. Thomas died defending the sanctity of marriage, Granholm won't risk an endorsement in defense of human life. If Granholm resembles anyone from St. Thomas' time, it would be solicitor-general Richard Rich. Her excuse? The anti-infanticide bill doesn't contain a "clear" exception for the health of the adult. Whatever that means. Of course, it's the "health" exception (which, thanks to Doe v. Bolton covers everything from genuine physical health issues on down to ennui--I exaggerate not) that has led to unrestricted abortion in this country. Let's leave for another day that the American Medical Association has said partial birth abortions are "not good medicine", nor is it ever "medically necessary." Now, of course, we are treated to the predictable scenario: the bongo-drum accompanied retreat of Michigan's Catholic bishops. Count on it. Take it to the bank. There will be muted ambiguous noises from diocesan offices which could be construed as disappointment, but that will be about it. This, naturally, will not satisfy those appalled by the spectacle of a putatively Catholic governor defending the "right" to crush the skulls of delivered viable infants, who will then contact their chanceries to ask when their shepherds are going to do something about it. Then Grima McGrath (or his equivalent) will deflect the issue and manage to castigate the faithful who treat the Church's teaching on abortion with the utmost seriousness, and some in St. Blog's will actually cheer Grima on in his efforts. There it will pretty much end. Unless we refuse to let it die, of course. More on the whole convert oath idea. I strongly recommend Greg Krehbiel's testimony as a whole, and his commentary on the oath itself is worth mulling over as a fine counterpoint to Mr. Gaillardetz (scroll down to "The Last Challenge"). You want some arsenic with that? The conundrum of the day: should I take communion in the Diocese of Saginaw, or engage its officials in ecumenical dialogue? I am beginning to learn the exact jurisdictional boundaries for the state of Michigan. Why? Well, there appears to be no place (I would love to be corrected) where you are safe from wrenching stupidity in the eleven counties that comprise the demesne of Bishop Untener. It started off pretty well, too. We were up for our college homecoming, and decided to attend the hometown's Catholic parish for Sunday. I tuned out the usual I've come to expect from Saginaw liturgy ("Rubrics? We don't need no stinkin' rubrics!") --you know, kneeling is medieval, the treacly affirmations from the God Is Privileged To Know Us Hymnal, the assured results of modern criticism (muted this time), etc. If I didn't let a lot of it slide, I'd never make it through. The surprise for me was that, despite the influx for homecoming, and the fact this was the only Sunday Mass for a big stretch of the county, the parish was half-empty. For whatever reason (law of averages? ), things weren't that bad. At the end of Mass, Fr. even emphasized the recent letter of the Michigan Catholic Conference regarding the passage of the Legal Birth Definition Act, and twice gave out the Governor's phone number to urge her to sign. Feelings of warm fellowship surged--bravo! I don't have to head to Lansing! Being Saginaw, of course, things couldn't go off without a big ol' hitch. A fat, heretical spanner heaved into the works. No, of course not. He then asked for anniversaries, birthdays, etc, in order to give the "community blessing." A couple announced they were celebrating their 36th wedding anniversary. My guard down from being fifty miles away from St. Joan Chittister, the different name of the blessing and my glowy fellowship, I forgot my previous encounter with the dread "Saginaw Blessing." Uh, oh. This sounds disturbingly familiar. Too late, I went to DefCon2. And give you her peace. I got lockjaw right after the first verse, as I finally realized what was going on. I've noted for future reference that the nearest parish in the Diocese of Lansing is approximately 35 minutes away. Following this, the too little, too late department met--plans for a Spanish language mass. Despite the fact there is a sizeable and growing Mexican-American community in the county, this particular parish is lily-white. Oddly enough, seven blocks away there is a burgeoning Pentecostal church headed by a Latino pastor. Plus, I need my sleep. I came within an instant of turning off the Michigan-Minnesota game last night (the way Elvis used to, if you catch my drift), but I didn't. It was nice seeing the Wolverines making history, instead of being on the receiving end of it, for once. Spoken Like a Convert, Part II. Take, for example, the "orthodoxy police"--the ever-handy boogeyperson of progressive-types. That such individuals exist is beyond question--nitpicking at this or that in the parish liturgy, perceiving ambiguities in a homily or publication as signs of apostasy--no doubt irritating, but such is the life of the Church, isn't it? Not exactly a new phenomenon, especially given the nature of the institution's teaching, which is organized, systematic, readily-available, and backed up by--well, an "orthodoxy police." If there is any religion that would tend to develop this sort of thing, it would have to be Catholicism. Speaking as an adult convert, I have a few observations about the Church I entered on the Easter Vigil of the Year of Our Lord 1999. The first is about, well, me, sorry to say. I cannot be what my wife and children are: cradle Catholics. I was born and raised a (not particularly-observant) Methodist. Catholicism was not part of the air I breathed from Day 1. Catechism, even of the prevalent 1970s-80s "God is love/glitter is sticky" variety, was not on my radar. Confession, First Communion, Confirmation--no landmarks for me. I had Catholic friends, sure--even family, although I didn't know that until last year, weirdly enough--but for me Catholicism was the peculiarly-shaped local church that ultimately reported to the guy in Italy heralded by the arrival of white smoke. No, I was a self-identified Methodist whose attendance was--shall we say--"infrequent." Also, the obsessions of progressive elements in the UMC were no spur to attendance--e.g., removing Battle Hymn of the Republic and The Star-Spangled Banner from the Hymnal? Get a grip, pinko. Although I did have a brief revival of faith in the early 1990s, with regular attendance (which rather startled the good-hearted Pastor, as I disrupted the age curve of the congregation) for a while, my moorings were shallow and I gradually floated away again. Thus drifting, I met my future wife--again--in law school. She was a cradle Catholic of slightly better attendance, and invited me to the occasional Mass. Then in 1998, after her gentle prodding following our engagement, I looked into Catholicism, more as a way of providing a unified front to the future chillins than anything else. "Move, dammit--we're going to be late! No, we'll have waffles at Big Boy afterwards...."
Just like Saul on the road to Damascus, or St. Augustine hearing the child's voice, eh? "And so Dale sayeth unto Heather, 'Yea, verily, I shalt looketh into the parish RCIA program. Doth that sound pleasing unto thee? Might as well maketh it easy for our begotten.'" Without giving you a draft proposal for Surprised by Truth XXI, I signed up. Why? Grace, first and foremost. Another reason? Because I was (and am) convinced that it was true. Verifiably (to the extent possible), objectively and thoroughly--true. As in, "making truth claims about Christ, God and life that demand your allegiance." Not just the head, but the heart. Especially the heart. Hell, the "head" part of my conversion was easy: "Yeah, this makes sense. A lot of sense. It fits together pretty well. OK, sounds good." The heart is a different matter entirely. Try convincing yourself of the whole shebang--at the gut level--before uttering this line: "I believe and profess all that the holy Catholic Church believes, teaches, and proclaims to be revealed by God." Without denigrating baptismal vows, mull over that oath--required of us convert-candidates for the Orthodoxy Police Academy. If that isn't daunting, you aren't thinking. If memory serves me correctly, it's required of all candidates for confirmation, too. Which, presumably, includes Mr. Gaillardetz. Yes, mine 'twas strictly a "head" conversion. Riiiiight. In my experience, the "head-only" converts stop showing up no later than three months after Pentacost following the Easter Vigil reception. Which brings me back to Mr. Gaillardetz, who strikes me as a bright and reasonable guy, even though he uses language like "embrace the brokenness of our church," making him sound like an emigrant from Griswold Country. We [cradlers] have long since learned to distinguish between the ruptures in fidelity that can call vows into question, and the daily gripes and reconciliations that are the stuff of vowed living. We have sorted out the essentials of our faith from the ambiguities, inconsistencies and, too often, even contradictions that are bound up in all that might count for “being Catholic.” We find we can embrace a whole set of tensions without losing fidelity. With complete certainty, I know that he and I have radically different understandings of what constitute ruptures in fidelity/the essentials of "our" (the?) faith vs. the daily gripes/ambiguities. With almost equal certainty, I know that for Mr. Galliardetz, Pile A is a lot smaller than Pile B. The article is, after all, published in America, where one can safely advance the thesis that the Church can overrule scripture at will. Apart from some occasional wistful commentary about what has been lost--the equivalent of someone sorting through one's possessions to determine what is being offered at the yard sale--the stones from Pile A are routinely chucked over to Pile B in the pages of America. Unfortunately, more of those stones in Pile B belong in Pile B. Maybe this sorting makes things easier--more reconcileable, for lack of a better term. More peaceful. But that hardly makes it right. Moreover, it fails to recognize the fact that the "rupturing of vows" is usually a process that starts with "daily gripes" and the like. Sorry. I just don't care to see Catholicism become the equivalent of Methodism with snazzier vestments. Speaking as a convert, this too-indulgent approach to what goes into Pile B has led to a squandering of the Catholic heritage, a too-cozy accommodation with the things of the world, and is arguably a contributing factor to the Scandals as well. All of which, whether Mr. Gaillardetz and the readers of America recognize/care or not, makes the "vowed living" and "reconciliation" stuff that much more difficult. Not to mention making it impossible to present a distinctively, fully Catholic alternative to a world in desperate need of it. One of the more peculiar early features of the Scandal was the surprising willingness of some self-identified orthodox cradle Catholics, upon considering the reaction of converts, to launch into chide mode. I remember reading comments about being "insufficiently converted," overfed on apologetics or similar forms of soul-reading that claimed that the outraged had a "head" faith, but not a "heart" faith (see no. 4). Yeah, OK, whatever. Mr. Dreher, as a convert to the Catholic Church, does not seem to realize that the church in this world is made up of a [sic] 100% fallible sinners from the pope on down. There are so many possible retorts to this condescending nonsense I don't know where to begin. Some even use words. One of my initial thoughts was "Sorry to be stinking up your church, padre." I guess the Scandals are just a blip in the onward and ever upward progression of the Church in these parts since 1960. They don't reveal a deeper problem or anything. Nope. Just keep whistling. Right past that field with all the rounded stones jutting up in neat rows. We lifelong Catholics have our own baggage, to be sure, and many of us are certainly not innocent of triumphalism. Still, most believe that our fidelity to our baptismal vows also gives us a freedom to embrace the brokenness of our church. We can criticize the church because our commitment to her has been chastened; we know we are in it for "the long haul." We have long since learned to distinguish between the ruptures in fidelity that can call vows into question, and the daily gripes and reconciliations that are the stuff of vowed living. We have sorted out the essentials of our faith from the ambiguities, inconsistencies and, too often, even contradictions that are bound up in all that might count for "being Catholic." We find we can embrace a whole set of tensions without losing fidelity. Well, if nothing else, it proves that soul-reading stretches across the Catholic spectrum. What can I say about the article as a whole? Like its orthodox cousin, it reveals a profound incomprehension of the realities of conversion, in this case reducing them to the simplistic us vs. them categories of the dividing American Catholic house. "This is not my team. This is not my team..."
I repeated to myself as the Red Sox roped me into cheering for them last night. Yeah--that's exactly what I need--to add the Sox to my portfolio of teams looking to win a full-blown championship in my lifetime: the Lions and Wolverines ('97 had to be shared with Police Blotter U, which still infuriates me). Thanks, Bryan. Then again, Grady Little's decision-making seems to be influenced by Madame Blavatsky's House of Tarot, so it might be easy to resist in the end. Congratulations to the Sox and their fans, several of the latter being St. Blog's members in good standing. One more thing: Death to the Yankees, the epitome of all that is evil. Please note that I did not limit that to sports. ...please be aware that four of the five are based on real events. The Mid-American Catholic Community Weekly, 10/12/03, pg. 7. In an effort to address concerns about openness and responsiveness to complaints here in the Diocese, Bishop Newkirk has created a new Diocesan Morale Office. A major part of the outreach of the Office is this column you are reading--a new question and answer feature written by Rex M. Pexniff, head of the DMO. Without further ado, we bring you the first installment of that column, entitled Smile Time! Hello, Siblings in Christ! My name is Rex Pexniff. Many of you may remember me from my time on the Diocesan Office for Ecumenism (where I helped put together Peyote and Penance, the very productive conference we had with members of native religions), my stint at the Diocesan Liturgy Office (where we launched very prayerful experiments in introducing Riverdance-style techniques for the Liturgy of the Eucharist), and finally, my time at the Diocesan Office for Catechesis, where I worked on adult continuing education issues and helped develop the "O Merciful Jesus--Now What?" program. Now, I look forward to serving you in the function of friend, guide and overall explainer of things here in the diocese. Don't think of me as just the Chief Diocesan Morale Officer--think of me as your catechist in the Chancery! And, goodness! From the mail people send to poor ol' Bishop Newkirk....Let me tell you, there are a lot of misconceptions about goings-on in the diocese held by a lot of gloomy gusses. Not to mention a whole lot of stinkin' thinkin'! But, that's what I hope to be able to change in my new job and this column. Because it's a new column, I don't have any letters directed to ST! yet. Instead, I'll look at some letters recently sent to the Diocese. 1. "Dear Bishop Newkirk: You need to act on the problems at St. Malachi's in Elyton--now! Our previously-referenced problems with the Mass here have taken a decided turn for the worse. During last Sunday's 10am Mass, Fr. Dingleman screamed "IA CTHULU FTAGHN!" during the consecration and immolated a ferret on the altar. This happened while auxiliary bishop Newman was here for the annual parish visit, so you can ask him. Afterward, Fr. Dingleman said "greater sacrifices would be needed to inaugurate the reign of the Great Old Ones." Given that the Children's liturgy is next week, we are especially concerned and believe you must do something about this--now!" This was very interesting. Very, very interesting! Does anyone else notice the problem here? Yes, of course--the tone of the parishioner. Why, if you got such a precipitous, demanding ultimatum ("do something now! "), what would you do? If you didn't tune it out, you'd throw it out! And the diocese gets lots of these kinds of demands every week. Come on, try again--but first with Fr. Dingleman, who's a great speaker! We're people, too--and we deserve to be treated nicely. As the proverb goes, you catch more flies with honey than with vinegar. 2. Dear Bishop Newkirk: Why is your Cathedral hosting a conference by the National Association of Rebellious Nuns (NARN)? Every last one of them has been either excommunicated or disciplined by the Vatican, and amongst the conference topics is "Reclaiming the Office of Cultic Prostitute for Our Time" and "Invoking the Great Earth Mother to Crush the Masculine"? What gives? Sorry--we just don't respond to e-mail from outside the diocese--it's not fair to us or productive of our time! 3. "Your Excellency: why is the NARN conference being held at the Cathedral? Why would the diocese sponsor a bunch of heretics, anyway?" Since this one came from a registered parishioner who gave to the last services appeal, I'll answer. First, the diocese is hardly "sponsoring" the conference--a private entity is handling the buffet line and open bar. Second, the church is a family--we don't label each other. Remember--judge not! Third, I know one of the nuns--Sister Medea Hekate--and she has been very enlightening when she has conducted liturgical and catechetical conferences for the diocese. Speaking of Fr. Dingleman, I know he found her presentation on liturgical renewal to be positively hypnotic. Sorry, friend: she's fully in tune with the spirit of Vatican II, and is hardly a "heretic." "Indeed, it can be said that, considering the role of the Bishop, he is indeed the Eucharist par excellence, given for the people of the diocese. One could say quite accurately that the Eucharist is my body, given for the life of my followers. Yea verily, I am the very bread of life itself." Isn't this out there--How can it square with 2000 years of Catholic understanding? I hope a retraction or clarification is forthcoming. Goodness me, the orthodoxy police have been out in force lately! Please, people Catholicism is not a religion of uniformity! It is a faith that prayerfully allows for a pluriformity of truths to dwell together in balance. Besides, have you ever taken Bishop Newkirk out for dinner to hear his side of the story? I didn't think so. As further food for thought, I've enclosed a copy of his work at the USCCB on the plight of Alsatian gypsy barley harvesters. You really owe it to him to read his work as a whole before passing judgment. 5. Your Excellency: I would like to bring to your attention some problems we here at St. Effusivius have been having with Fr. Wunderbar. As you may have seen two months ago on CNN, Fr. Wunderbar announced he was "coming out of the closet as a protest against the heterosexist tyranny that is the Catholic Church and its local tinpot, Newkirk." When several members of the parish approached him and asked what this meant for the observance of his vows of celibacy, he refused to respond. After further questioning, he threatened to "excommunicate the entire queer-bashing lot of [us]," and exclaimed "that it was none of [our] damn business." He repeated this verbatim at his masses for the next month. In addition, he has been observed hanging out at a bar called "The Tool Shed" on a daily basis, has added a feather boa to his vestments, and replaced the creed with the lyrics to "It's Raining Men." Most disturbingly, he also insists on baptizing everyone in the buff. The enclosed VHS tapes document this behavior. Please intervene--it's tearing the parish apart. Dear me: another liturgical complaint. We get so many complaints about the liturgy that I think some people would be happier in the Orthodox Church. What I'm hearing here is a lot of talk about rubrics, but not much love. The only "love" I hear is, sadly, self-love. Honestly--if some people didn't have something to gripe about, they'd be lost. Try this instead: Give Fr. Wunderbar a hug. Take him out for steak fries. Allow him to indulge a little creativity. Parish life is all about give and take. Well, that's all the space I have in the inaugural column. Feel free to write ST! care of the paper. Next time, people--let's have some happy talk about all the good stuff going on here. I hate how Grandma drives..."
Like a skunk at a garden party. Some people just can't take a hint, it seems. People like Presiding Bishop of the ECUSA, Frank "Can't Parse This" Griswold. Griswold, a major source of greenhouse gases and a man whose flair for bafflegab can be compared to ether, simply "must" participate in the consecration of an auxilliary bishop for an Episcopal diocese that can't stand him. While no doubt irritating to faithful Anglicans, normally this would be no skin off the Catholic nose, so to speak. The catch? Because of space concerns, the Episcopalians were planning on using a church in the Catholic Diocese of St. Augustine. All well and good, as this batch of conservative Piskies gets along pretty well with their southern mackerel-snapping neighbors, and both are trying to emphasize the "brethren" in "separated brethren." Alas, neither side had reckoned on the unannounced arrival of a very, very separated brother. Alas--Enter The Griswold. In a newspaper article, the Grizz announced that he was going to be participating in the consecration. As is his wont, he also extemporized on the new received wisdom that permitted the elevation of Mr. New Hampshire. Oops. First, it's a little peculiar that Frank wants to go to the Episcopal Diocese of Florida. After all, it's clear that the Floridians think he and his coupmates belong in a ward for the theologically insane. Second, Catholic Bishop Victor Galeone, with a better grip on scripture than the Grizz and the Constitution than the Ned, said no way. Frank can watch--preferably from the Uecker seats--but if he wants to put on his big hat and join the festivities, the Anglicans can take it to the KOA. Galeone said Wednesday he was revoking the invitation after he learned that Griswold planned to officiate. "Many of my people would be deeply offended to learn that an Episcopal bishop, who holds a position that is radically opposed to what both the Catholic Church and Scripture teach about homosexuality, is using one of our facilities," Galeone said. For starters, three cheers for Bishop Galeone! In our day of hurt-no-feelings ecumenism, this takes some guts. May his tribe increase--by about a hundred. "My ministry as presiding bishop calls me to do all I can through my office and personal presence to help us all realize that, in spite of deep disagreements, we are one in the body of Christ," Griswold wrote. "I have been called to serve the whole church as presiding bishop, not only those who hold one view or another." Er, well, it seems that your office bears a great deal of responsibility for the split, Frank me boyo. Moreover, it's an odd notion of unity that pretends there's common ground between the bedrock principles of Scripture as the Inerrant Word of God and Scripture as So Much Quilted Two-Ply. But, that's not a Catholic problem. Here's hoping Bishop Galeone sticks to his guns and Frank parks his Forcefield O' Unity in a pew or activates it at the Best Western. Something tells me Florida Anglicans would be at least somewhat satisfied with either result. As with all things Anglican, make sure to check out the Midwest Conservative Journal on a regular basis [all of the above CofE links were obtained from the site]. Erstwhile-Episcopalian Chris Johnson has made it is duty to cane the Grizz at every available opportunity, and he does so in an inspiring fashion. Pray, pay and obey. Basically, because complaining is (1) goofy because it's no big deal--just another group pumping more CO into the air ducts; (2) an ego trip--you're never happy; (3) pointless, because if they're not listening, why bother; (4) counterproductive, and it's better to do nothing; (5) if you absolutely must (and you really shouldn't), it's better directed to publications and groups the university/archdiocese already ignores/barely tolerates. If I read it correctly, don't complain because it's tacky. It's mean. Let the diocese handle it. Quietly, with romanitas. Or, more likely, not at all. But that's OK because, ultimately, they know better than you. Well, why not? It's certainly tried and true. Not to mention that it's served us all so well in the recent past. My late father-in-law Louis was a CPA who ran his own business. When he was starting out in 1979, he emphasized to the local phone company that he had to have the phones on by a certain date, because that was the date he was opening for business. When the day came, he noticed a glaring error: The phones weren't working. While admittedly not as mortifying as what happened to Niles Crane's misspelled ad that was supposed to announce the fact he was a "Jung specialist," it was still a problem. After all, unlike Niles' phone, Louis' wasn't exactly going to be ringing off the hook. Louis was a former paratrooper, but despite that he was not given to thoughtless profanity. Nevertheless, he was perturbed by this development. He immediately contacted the company and was told by the ground level types that the problem would be remedied. Two weeks later, the phones weren't on. Louis had gotten his last runaround. He had a wife and three kids, and the company's ineptitude was harming all of them. He came home infuriated and dialed the phone company. A low level employee answered. Louis: "My name's Louis, and I'm a customer who was supposed to have his business phone activated two weeks ago. Here's my info. I want my phones on." Employee: "Sir, I don't handle--"
Louis: "Get me your boss. Now." Boss: "Hello--can I help you?" Louis: "I want my phones on. Now." Boss: "I'm afraid I don't--"
Louis: "Get me your boss." Boss' Boss: "Hello, can I help you?" Louis: "My phones were supposed to be on two weeks ago. I want them on--now." Louis: "Put your boss on--now!" The Company President: "Hello, Mr. Louis. I understand you need to speak with me." Louis: "Before you get started, I have one thing to say: I want my ******* phones on, and I want them on now." The Company President: "Absolutely. They will be." Two hours later, they were. Moral of the story? I don't know--though I certainly hope that it's not "the phone company's got a better grip on scripture than your local chancery." Why don't you decide, gentle reader? "I knew that! You think I didn't know that? Of course I knew that! I'm not being defensive! You're the one being defensive! Why is it always the other person being defensive? Ever think about that? Why don't you think about that?! Is it me, or is it him? It's him, isn't it?" Or, Memo to Metro Detroit Catholics: "Lose the e-mail address. Now." UDM and the Archdiocese got caught in the National Catholic Register's klieg lights over Call to Action's Nun 'n' Fun Conference hosted by the University a few weeks back. Face facts--the mentality that wishes lay people would simply pray, pay and obey is far from dead, as the lame responses from the relevant Catholic authorities show. Let me see--10? No, not even close. How about 20? Nope, still not enough. 30, maybe? Nah, a little too subtle. Let's try 50. At the conference, members of the coalition elected Sister Jeanine Grammick, Sister Beth Rindler and Sister Donna Quinn as the organization’s new executive team. The Vatican suspended Sister Gramick’s outreach to homosexuals in 1999. Sister Rindler began an underground women’s Eucharist group in 1991 — a group that meets monthly to celebrate Mass without an ordained male priest. Sister Quinn is the co-founder of Women-Church Convergence, a coalition of 32 feminist groups committed to a participatory, egalitarian and self-governing model of church. Care to guess the name of the lead investigator whose efforts led to Gramick's suspension? Come on--think ironic. Really, really ironic. As in "Wake the hell up!" ironic. Here's Women-Church Convergence, which is especially useful if you forgot to take your senna this morning. Then there's Sister Rindler, an advocate of the same thing that got Tony Padovano the bum rush last May. Yet Sr. Rindler is perfectly welcome, smack in the middle of the Archdiocese. 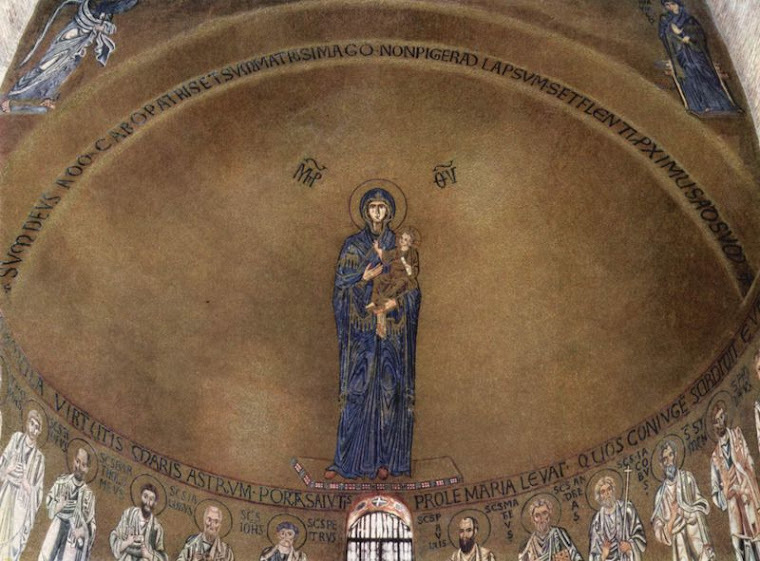 Perhaps Padovano's right: The Church is sexist, after all. “The speakers are women of conscience,” Sister Rindler said. “They were led by God, you might say." You might. Sophia knows we wouldn't, but you might. You knuckle-dragging kyriarchists. Unless we say it. Then you'd better snap to, buster--you'd be amazed how quickly we can revert to our ruler-wielding ways when the mood takes us. Gesund was one of the local Catholics who contacted both the university and Cardinal Maida’s office. “Nothing happened,” she said. “That’s what is so frustrating. I don’t understand the silence in the face of public scandal. The shenanigans that go on are the direct result of the silence from the leaders of our Church." Cardinal Maida could not be reached for comment. Pecksniffian/Mottramist silver lining? "Well, at least he's consistent on this issue..."
Now, the moment I've been waiting for: Adventus Neddum. Ned McGrath, director of communications for the archdiocese, said the archdiocese was unaware of the conference. “We didn’t have any knowledge of it aside from a notice of it in the diocesan newspaper,” McGrath said. Er, look at the cc: for my e-mail. Also, NM's comment about the newspaper invites the following volley: What was it doing there in the first place? Ack. If I had three wishes from the lamp, one of them would be expended on a mandatory national remedial constitutional law class for all citizens, in which it would be drilled into the heads of the students that THE PROTECTIONS OF THE BILL OF RIGHTS APPLY TO WHAT IS CALLED "STATE ACTION" AND DO NOT APPLY TO PURELY PRIVATE ENTITIES NOT ACTING ON BEHALF OF THE GOVERNMENT--E.G., MY NEIGHBORS DO NOT HAVE THE RIGHT TO ASSEMBLE IN MY BACK YARD TO, SAY, RE-ENACT "P*** CHRIST." In other words, Mr. McGrath, I submit your constitutional argument needs work. McGrath would not comment on how many letters or e-mails the archdiocese received. Enough to interfere with his ability to find Zig Ziglar's "Lift for the Day" in his inbox, apparently. “We receive calls on all sorts of things,” McGrath said. “If they are from people within the diocese, we deal with them as best we can. They are responded to on a case-by-case basis. Still waiting for your response, Ned. My constitutional right to free speech is being stifled by your refusal to acknowledge me! University president Sister Fay did not respond to Register inquiries. She really, really wanted to--until she realized you were the Register, and not the Reporter. Imagine that happens all the time. The communications department has received no phone calls or e-mails regarding the event,” said Gary Lichtman, media director for the University of Detroit Mercy. Are they for real? Seriously? Real serious? Well, I'm sure the Bosnian lunch lady at the school cafeteria didn't get any calls or e-mails either. I would hope they would concede that a chain of command that requires you to go to the Audio-Visual Department to get things done is a mite perplexing. She got at least one. Trust me. "Nope, nothing to do with it a'tall. Nope. Even though we're not in the process of demanding a retraction from CTA regarding its notice or anything. It could have been held on Mars--er, Venus--for all we had to do with it." Believe me when I tell you that UDM will not run that splendid piece of legerdemain past a jury in a slip and fall case. Not successfully, anyway. The rental policy for the conference center states that the university “reserves the right of refusal for any group,” but Lichtman could not say whether the university had refused to rent the conference center to any groups in the past.